Open in Read Only mode if plugin syntax errors are detected: Opens scenes that contain plugin node errors in read-only mode to prevent you from losing plugin information on subsequent saves. Default to Element Palette Lists: When this option is enabled the new, cloned, duplicated, imported and linked palettes will be stored in the Element Palette list instead of the Scene Palette List. 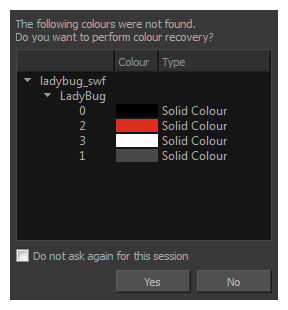 Interactive Colour Recovery: If a colour palette required to display a drawing is not found because it was moved or deleted from its location, you will be asked if you wish to recover the missing colours into a new temporary palette. If this option is disabled, the colour recovery will happen automatically without your confirmation. Colour Recovery: By default, if a colour palette required to display a drawing is missing because it has been moved or deleted, Harmony recovers the missing colours into a new temporary palette. If this option is disabled, Harmony will skip this step and display the zones painted with missing colours with the Replacement Colour, which is solid red by default. Replacement Colour: If certain colours are no longer available, Harmony will display the replacement colour in the zones painted with missing colours. You can select the colours for a lot of coloured elements in the user interface of Harmony. NOTESome changes to colour preferences may not appear until Harmony is restarted or until the affected view is closed and reopened. Current View Border: Sets the colour of the frame around the workspace view you are currently using, also known as focus. By default, the colour is red. Click on the red colour swatch to select a new colour in the Colour Picker window. Current View Border in Template Edit: Sets the colour of the frame around the workspace view you are currently using when editing a template from your library view. By default, the colour is green. Click on the green colour swatch to select a new colour in the Colour Picker window. Edit Colours: The Edit Colours button opens the Colours dialog, which allows you to set the colour for dozens of visual elements in the user interface. Auto Apply: When enabled, values entered or options selected in node editors are automatically applied to elements in your scene. 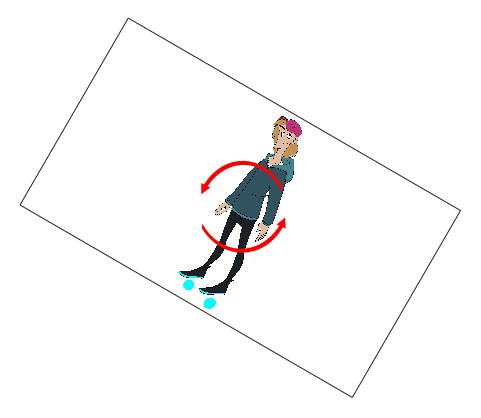 The Apply and OK buttons are hidden in the Layer Properties when this feature is enabled. 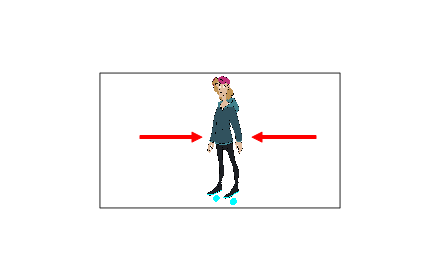 Snap Keyframe: If two keyframes have the same value, they will both update to the same new position when the first of the two keyframes is modified. 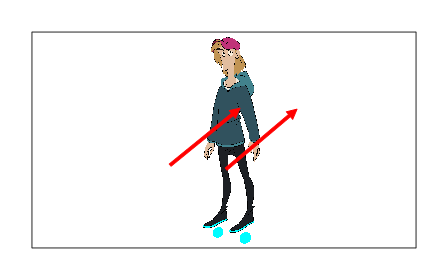 The previous keyframe has to be a Stop-Motion keyframe. Auto-Get Rights to Modify Drawings: When using Harmony Server, this option will automatically grant you the right to modify a drawing as soon as you attempt to make a change to it. 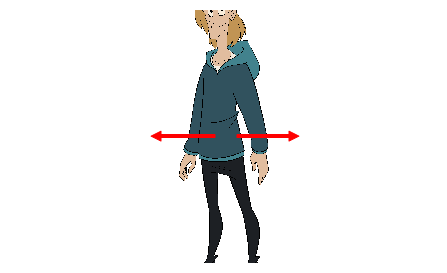 If disabled, you must manually obtain the rights to each drawing you want to make changes to. 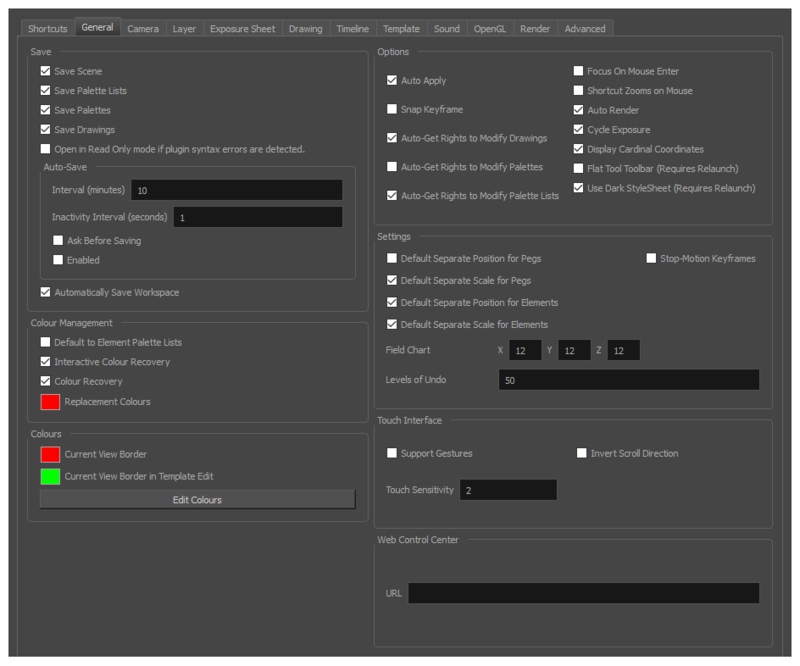 Auto-Get Rights to Modify Palettes: When using Harmony Server, this options automatically grants you the right to modify the colour and texture swatches in a palette as soon as you attempt to make such changes. If disabled, you must manually obtain the rights to modify a palette before attempting to make changes to it. Auto-Get Rights to Modify Palette List: When using Harmony Server, this option automatically allows you to make changes to the palette list. If disabled, you must manually obtain the right to the palette list before adding, removing or reordering palettes. Shortcut Zooms on Mouse: When enabled, shortcut zooming will centre on the cursor location. Auto Render:Controls whether the Camera view's Auto Render option is enabled or disabled when launching Harmony. When Auto Render is disabled, if any change is made to the scene while the Camera view is in Render Preview mode, it will switch to OpenGL Preview mode. When enabled, it will merely refresh the render preview. Cycle Exposure: Make navigation in the Xsheet View wrap-around from the last frame or the last column to the first. Display Cardinal Coordinates: When enabled, coordinates displayed in the application are expressed using cardinal points. For example, 1N2E means 1 field to the north and 2 fields to the east. When disabled, coordinates are expressed in scalar notation. For example, 1N2E would be expressed as +1,-2. Flat Tool Toolbar (Requires Relaunch): When enabled, the Tools toolbar will display each tool in its own button, instead of grouping certain tools together in pop-up menus. Harmony must be relaunched to apply a change to this preference. Default Separate Position for Elements: New elements are created with separate position functions. Default Separate Scale for Elements: New elements are created with separate scale functions. X: Default value for the number of units in the X axis (east-west) of the field chart used for new scenes. This value should be half the total number of units in the X axis of the field chart. This value will appear by default in the Alignment dialog box. Y: Default value for the number of units in the Y axis (north-south) of the field chart used for new scenes. This value should be half the total number of units in the Y axis of the field chart. This value will appear by default in the Alignment dialog box. Z: Default value for the number of units in the Z axis (front-back) of the field chart used for new scenes. This value will appear by default in the Alignment dialog box. Levels of Undo: Determines the number of actions retained by the Undo list. By default, 50 actions are stored in the list. You can alter the number if you want to. This setting is only available in Harmony Stand Alone. It is made to allow Harmony to connect to a WebCC server. When working on a scene exported from WebCC, you can download changes made to the scene from the database and upload changes you made to the database from Harmony. NOTEIf the URL starts with the name of the server rather than the protocol, http is presumed.